Just as U.S. Senator John Walsh was finishing up his first day as Montana’s newest senator, American Crossroads hit the Montana airwaves with a negative ad about him. They plan on spending $138,000 in Montana to run the ad. Having American Crossroads come out against him may be good news for Walsh. In the 2012 elections, American Crossroads mostly failed to defeat any candidates they opposed, although they spent about 104 million dollars. By the way, that amount includes about $1.8 million they spent opposing Jon Tester who beat their man, Denny Rehberg. Walsh has an ad up of his own. In my opinion, it’s pretty disgraceful for American Crossroads to attack a veteran. It would be nice for Senate candidate Steve Daines to come against the groups who attack Walsh over his service to our country – that is if Daines cares for veterans as much as he leads us to believe. This is a waste of time for Daines, but it did get him and Montana Attorney General Tim Fox a few minutes of publicity. I have no problems with a national standard for driver’s licenses and ID cards – just as I have had no problem with the Patriot Act. Freedom isn’t free. 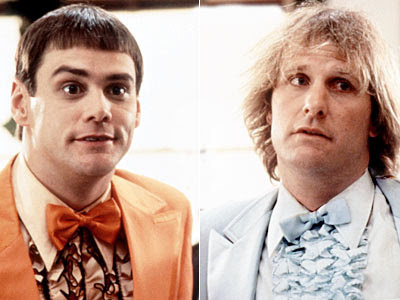 During the Daines and Fox press conference about REAL ID, did anyone notice they resembled Lloyd Christmas (Jim Carrey) and Harry Dunne (Jeff Daniels) from the movie, “Dumb & Dumber?” Compare THIS to THIS. While I am disappointed that Governor Steve Bullock did not select a veteran to serve as his Lt. Governor, Angela McLean seems like a very nice person who will bring a different dynamic to the office. We do need more veterans serving in state-wide offices in Montana. The good news is since Lt. Governor McLean was a teacher, the job of Lt. Governor will be a lot like summer vacation compared to the teaching job. Anytime there’s a change in the U.S Senate, committee assignments change because of seniority. To me it’s kind of like waiting to see where your team will be playing during March madness! Senator Jon Tester is now “Chairman” Tester. He heads the Senate Indian Affairs Committee. This is great news for Native Americans in Montana – and hopefully his clout helps the Little Shell tribe obtain federal recognition. Senator John Walsh received his committee assignments. He will serve on Agriculture, Nutrition and Forestry, Commerce, Science and Transportation, Rules and Administration, and Special Committee on Aging. While I had hoped Walsh would get a coveted seat on Armed Services, these four committees are important to Montana. The Great Falls Tribune has contacted officials at Beartooth NBC about the low-power NBC station in Great Falls and the “lower-resolution analog picture” it provides. I applaud the Tribune for checking into the problem. It’s really bad – the picture freezes for a few seconds, goes black, and the resolution is very poor quality. I also contacted Beartooth NBC via e-mail in August just before the NFL season started to find out when they planned to upgrade. I received notice that my e-mail was received and then forwarded to someone named Thomas Giammaria. I then received notice that it had been forwarded to someone named Jim Meir. It was never answered. That was in August. These days I only watch NFL Sunday Night Football and sometimes Saturday Night Live on NBC. I did try to watch about an hour of NBC’s Olympic coverage – by the way Bob Costas’ eye problem can’t really be detected too easily on the low-power station. I can’t believe anyone would pay to advertise on KBGF in Great Falls. The folks at Beartooth NBC should upgrade the station so it provides a digital signal or get out of the business altogether. If you’ve read many of the columns on this website, then you know I have a very negative opinion about many Montana judges. That opinion continues. Now we have another Montana judge who is acting like a moron from the bench. Luckily the judge’s ruling only applies to Lincoln County. Hopefully the State Supreme court will slap the judge’s ruling down quickly – and during his next election, maybe the folks in the Lincoln County area will elect someone besides James Wheelis. This section is where I mention people or groups whose actions embarrass Montana in some way. On their website, the Gazette hyperlinked the story to the words “Throwing daughter” which probably increased web traffic considerably. Although Priest is innocent until proven guilty, that $1500 bond hardly seems enough, but that’s Montana judges for you. This entry was posted in Caught My Eye... and tagged 24/7 DUI Program, American Crossroads, Angela McLean, District Judge James Wheelis, Dumb & Dumber, Jason Priest, John Walsh, Jon Tester, KBGF, Making Montana Proud, Steve Bullock, Steve Daines, Tim Fox, Veterans by Jackie M. (Mike) Brown. Bookmark the permalink.